Among the general public, artists and critics alike, The Family of Man gave rise to both celebration and controversy. Today the exhibition has achieved legendary status in the history of photography. The brainchild of Edward Steichen was created as a reflection of humanity and aimed at forging closer links between people, with the post-war photography serving as a vehicle for his humanistic message. For his ambitious project, Steichen gathered 4 million photographs, of which he chose 503 by 273 artists from 68 countries. The exhibition was conceived as a manifesto for peace and the fundamental equality of mankind. It staged images by artists such as Robert Capa, Henri Cartier-Bresson, Dorothea Lange, Robert Doisneau, August Sander, Ansel Adams, etc. in a modernist and spectacular manner. Shown for the first time in 1955 at the Museum of Modern Art (MoMA) in New York, the exhibition attracted close to 10 million visitors on its international tour, following which it was bequeathed to the Grand Duchy of Luxembourg. The fully restored collection is today a historic exhibition and piece of photographic heritage. 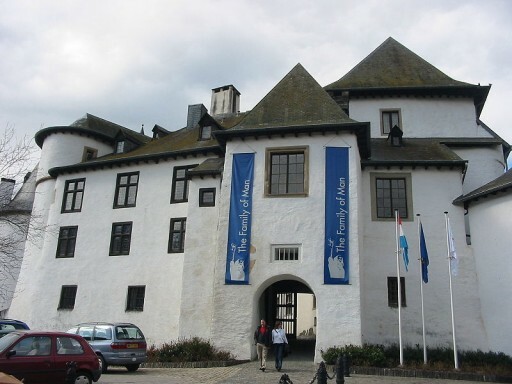 It is housed in the renovated rooms of Clervaux Castle, combining a contemporary approach and interpretation with a reverence for its history.